Time to Hook Your Car Onto the Road Train? All aboard! A road transport concept known as road trains may be a partial solution to energy savings and pollution reduction on major motorways according to Greenbang. This concept, which is presently being used by long distance motor freight hauling in countries like Australia and Argentina may soon be adapted for “towing” private cars as well. For the uninformed, a road train usually refers to a motor freight transport in which two or more transport trailers are attached to a truck “tractor” for long distance hauling. 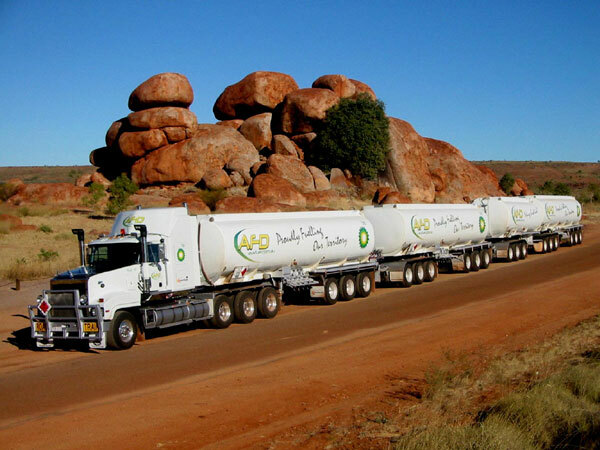 This concept has been used by Aussie truck drivers for years to haul cargo across the vast Australian outback, which saves having to have two or more trucks on the road to haul the same amount of freight. Now, a different version of the road train concept is being worked on by a consortium of European organizations to find ways to make a similar transportation system for cars in order to not only save fuel, but reduce the amount of auto emissions as well. These organizations have organized a project known as SARTRE, which means Safe Road Trains for the Environment. 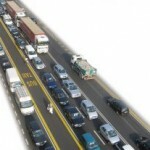 Under this concept, a number of car drivers will “connect” themselves electronically behind a truck or similar vehicle and become part of a ‘road train’ which will enable them to move down the highway driverless and without having to have their foot on the accelerator pedal (sort of like a group participated cruise control). The method, which frees the driver from actually driving the car while “on board” is estimated to save fuels costs by as much as 20%, as well as being less polluting. By use of special wireless communication systems, drivers will be able to read, rest, eat, make phone calls and do other tasks that are not normally possible while driving. One might wonder if this concept would catch on in Mediterranean countries, as well as in the Middle East, where driving often takes on the form of an adrenalin rush and where short tempers often lead to numerous road accidents. Drivers in these countries would have get used to not being ‘in control’ of their vehicles while being a part of a road train; especially in countries like Saudi Arabia, in which we explored in the article on the deathly Saudi road games. Saudis having the highest percentage of road fatalities in the world (of course they do as women are not allowed to drive; maybe women could drive on the road train, because technically they’re not driving). Or how about Lebanese high-line car owners; where glitz and status are more relevant than other issues, especially protecting the environment. And last, but not least, there’s that billionaire in Abu Dhabi, who owns a white gold V10 Mercedes Quad Turbo sports job that can do a 1/4 mile in 6.89 seconds. We’re sure he can’t wait to take the car train – or is it the Night Train? All in all, I really don’t think that the Middle East is quite ready to fall in line for this kind of road trip. Or maybe the most intelligent solution yet, is just trains. If we had more of them, and more tracks laid down we wouldn't need long-haul truckers (sorry guys), and so many passenger vehicles on the road.